Melt one bag of candy melts in the microwave, in 30-second increments, until smooth. Prepare a cookie sheet with parchment paper on the bottom. Dip three pretzels (one at a time) and place together with the bottoms touching as much as they can. Break one pretzel apart to create a stem and dip it in the candy melt, attaching at the base of the shamrock shape. When all of the shamrocks are created, spoon more candy melts on top to fill in any holes and to bring out the shape. Wait 30 minutes to allow the shamrocks to set, then pipe green icing around the edges and quickly sprinkle just the green icing edge with green decorating sugar. Mini pretzels are coated with white chocolate and decorated easily for a one-of-a-kind St. Patrick's Day treat. Top o' the morning to ya! Has March rolled around already?! We're in the season of Shamrocks, Leprechauns and Irish Cream and I won't lie ... I kind of love it. We thought it would be fun to create the signature Saint Patrick's Day shamrock shape out of easy-peasy pretzels that are perfect for a St. Patrick's Day party. They're so delicious, they're almost as good as a pot of gold! Gather the simple stuff you'll need. Here's the basic idea. See how the pretzels form the shamrock? Using the microwave and a microwave-safe bowl, melt one bag of candy melts until smooth. Dip three pretzels (one at a time) and place together with the bottoms touching as closely as possible. 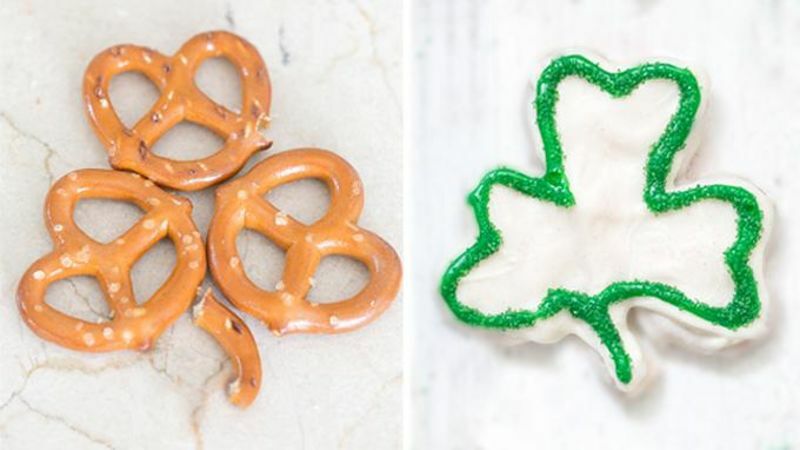 Break one pretzel apart to create a stem, dip it in the candy melt and add it to the bottom of the shamrock shape. Once all of the shamrocks are created, spoon more candy melts on top to fill in any holes and to bring out the shape. Allow to set 30 minutes. Pipe green icing around the edges and garnish with green sugar. And ... you're ready for a great shamrock day!